I have this and a Botanica tucked away in our cellar from ’09. Haven’t tasted either of them from that year yet. Trying to wait. Got to taste the ’06 and ’07 side by side and there was something very special about the ’07. Have one more that I am trying to save for another year or two. Nice! 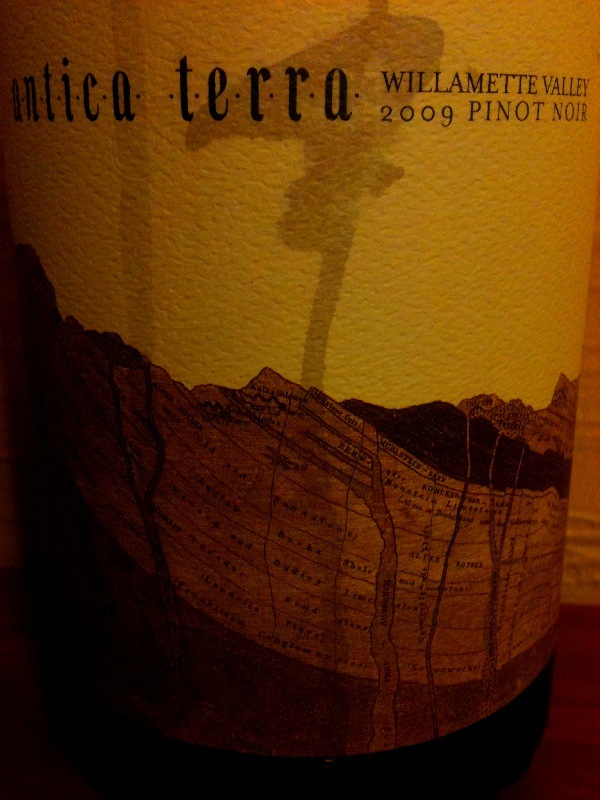 Antica Terra in my experience tends to be a bigger style that can be silky but more reductive. They have a Roussane coming out soon that is to die for…their Chardonnay is quite beautiful as well. I’m finding that ’09 Pinot may show better on the earlier side of the bell curve, as it was a hot year like ’06 and ’03. I went to the Oregon WIne Symposium this week and saw a slide for anthocyanin content in Oregon Pinots from the last few years. The data showed lower levels of anthocyanins (flavoring and textural components) in ’06, ’08 and ’09 than ’07, which was a cooler year, and one that was panned by big critics, but can be, like you say, a beautiful vintage from the right producer. I think that hits on what I am learning more and more: it is all about producer. Sure vintage matters, but the best producers understand how to work with that vintage variation to craft a ‘consistant’ but ‘transparent’ wine. Cheers! Thanks for the advice on ’09. I hope you don’t mind, “reductive,” what does that mean to you? No worries! Wow, where to start… I might direct you elsewhere, but to start: many Pinot Noirs and a vast majority of white wines are produced reductively. Reductive is a word that describes a vinification style first and foremost. Many wines are produced ‘reductively’, which means the vintner aims to exclude oxygen at points where the wines character will be compromised and compacted by the effect of ‘oxidation’. On the other side of this coin, is reduction, which also can compromise and compact wines, though oxidation is a forever thing and reduction can blow off with air in the best cases, though it can also be a forever thing. In this case, reduction describes sensory characters that are present in wines as a result of reduced sulfer compounds. Reduction for me comes across as flint, match stick, hard boiled egg, rubbery, burnt, hairy, garlic, onion, fresh asphalt… Wow, I could go on and on, but this (http://bit.ly/x2MjBm) is a great read and will answer all your questions with better background, science and the like. I gotta go hustle some wine. Thanks for being so inquisitive and for your support of my ramblings:) May Bacchus always bless you with overflowing glasses of REALwine!